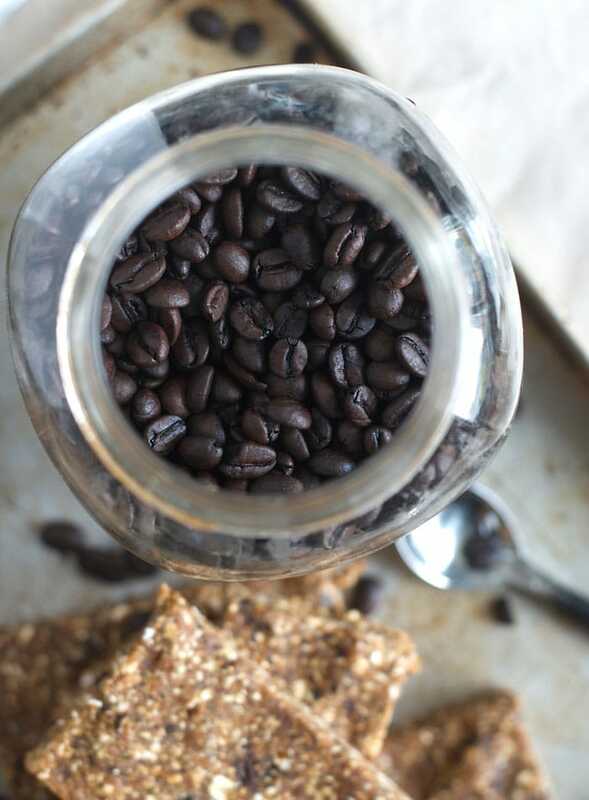 No-Bake Vanilla Espresso Date Energy Bars. The name says it all. Pure vanilla, coffee beans, sweet dates and wholesome oats is all you need to make these vanilla latte inspired date energy bars. Plus some sea salt which is optional but totally recommend to take the flavour to sweet and salty perfection. These oat date bars have a soft and chewy texture with hints of caramel and vanilla and tons of coffee flavour. They’re no-bake, can be prepared in minutes and enjoyed as energy balls, small snack squares or larger energy bars. Enjoy them for breakfast, a pre-workout snack, dessert or anytime you want a natural boost in energy. These no-bake date bars were inspired by the Low-Fat Cinnamon Energy Balls I shared a few weeks ago. I just the simple combination of oats and dates for the flavour and texture as well as the nutrition benefits they provide. 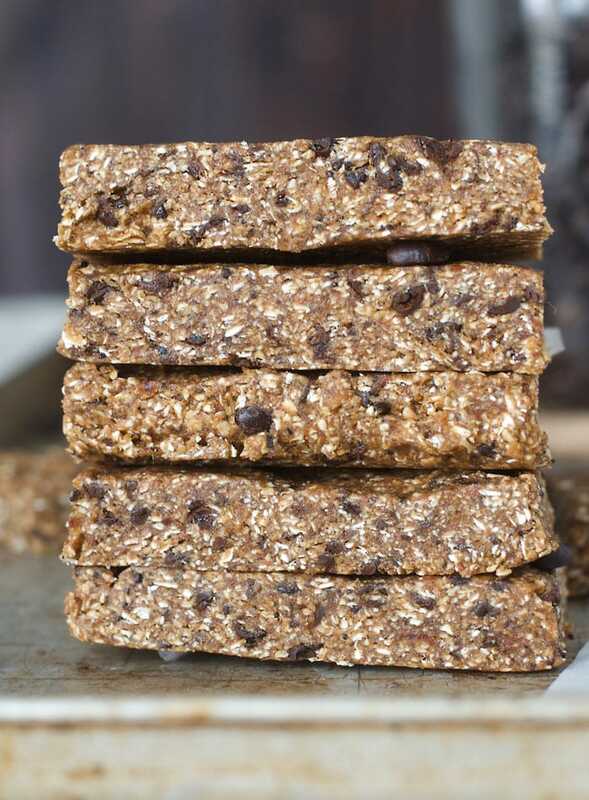 These bars are ideal before a workout since they’re easily digestible and provide a nice boost in energy from the carbohydrates and caffeine. 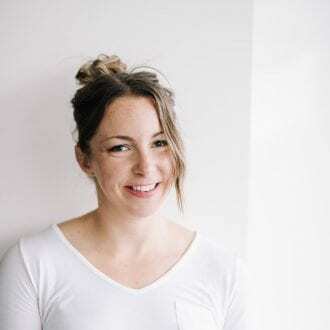 A lot of energy bars are made with nuts and seeds and I have plenty of those on my blog but I like to have low-fat snack options along with the higher fat ones. I just depends on the day and what I feel like eating. These simple bars are virtually fat-free but don’t contain any added sugars like you might find in processed low-fat energy bars. They’re sweetened naturally from the dates which also contain vitamins, minerals and fibre along with the natural, caramel flavour they provide. You can make these with regular coffee beans or if you’re sensitive to caffeine, you can use decaf coffee beans. I only used 1/4 of coffee beans for a whole batch of bars so the caffeine in each bar is probably quite low however if you ate them right before bed and you’re sensitive to caffeine, it may affect your sleep quality. 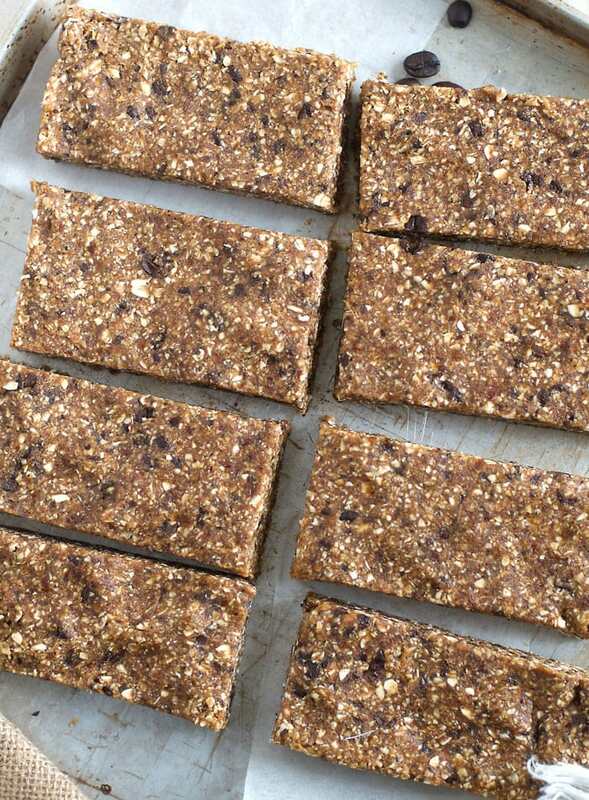 This recipe can be made into energy balls, smaller snack-sized squares or larger energy bars. I’m not sure how many balls you’d get out of it as I made mine into a mixture of balls, squares and bars. I would think the recipe would yield about 24 balls though. The nutritional details provided are work if you make this recipe into 16 squares, in which case each square will have 117 calories, 25 grams of carbs, 2 grams of protein and less than 1 gram of fat. If you’re making large energy bars, simply double the nutritional facts. These bars are vegan, low in fat, oil-free, gluten-free and have no added sugar. They make an ideal energizing snack before a workout or snack you can take along with you on a busy day. If you love coffee, you’ll love the caramel vanilla latte flavour of these bars. 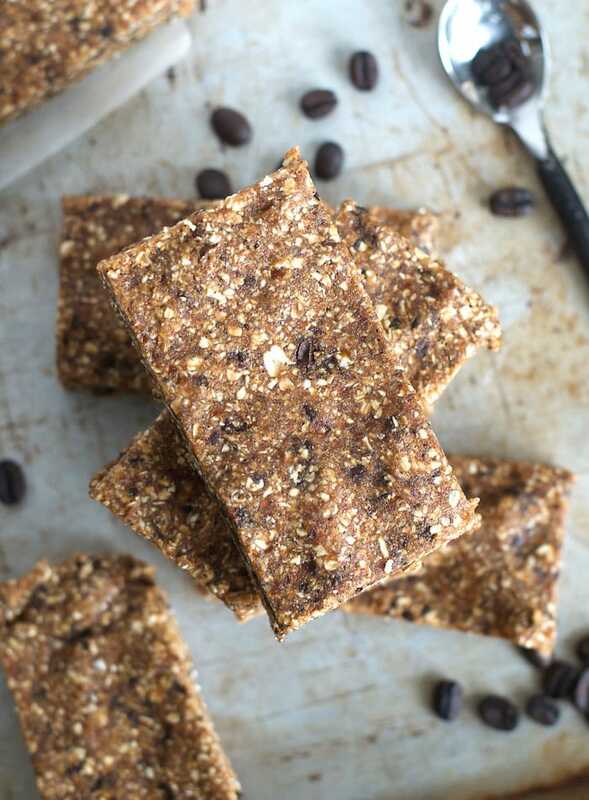 These no-bake vanilla espresso date energy bars are energizing and delicious. You can roll them into balls, cut into squares or into larger energy bars. They’re vegan, gluten-free, require just 4 simple ingredients and contain no oil or added sugar. Add all ingredients to a food processor or high-speed blender and mix until it forms a thick dough. Press the dough into a parchment or wax paper-lined square baking pan. Alternatively, roll the dough into energy balls. Place in the fridge for freezer for a couple of hours before lifting out and cutting into 16 squares. oh wow these look great! and they have coffee in too even better! Tried these yesterday ! Absolutely delicious, easy and fast to make ! Thanks ! Awesome, so happy to hear that!! If I was going to use already ground coffee instead of beans, how much would you recommend using? Just slightly less I guess? Can’t say the exact about but a scant 1/4 cup should be fine.